Every once in a while you may come across a hostel known for something. It could be a hikers’ hostel (we stayed in one in Gran Canaria), a hostel on an eco-farm (Colombia) or a surf hostel (Portugal). Hostel Euphoria in Tallinn is known for being a music hub. From far and wide, musicians come here to stay and to meet each other. During most of our nights in Euphoria, the common room turned into an impromptu band rehearsal. We felt like we had hit the jackpot in terms of finding other musicians (did you know that Dan plays the drums?) to jam with. 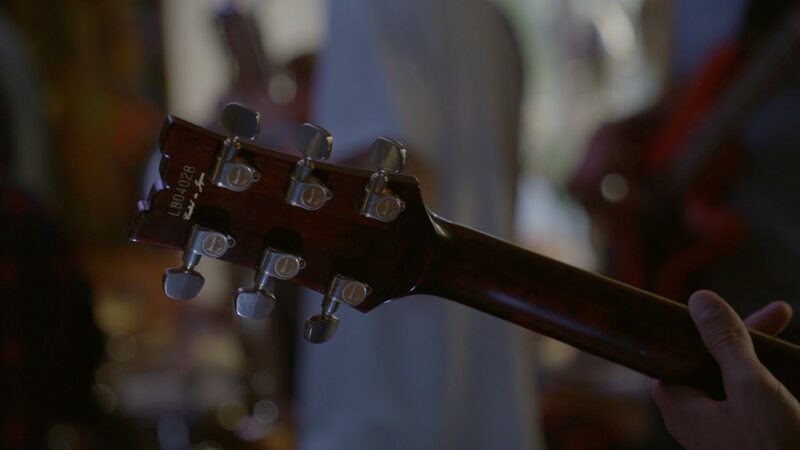 Euphoria’s owner, Jonathan, started the hostel after traveling the world as a guitarist and he has now made a home for music lovers from everywhere. He has been in Tallinn for a decade and introduced us to so many things we should know about Estonia. Euphoria has both dorm and private rooms, all which look out either to the street or to the small road behind the building. The stairwells are decorated with colorful hand-painted art. Right off the reception area, is a common room that also functions as the music jamming space. There are guitars, a drum set, a keyboard piano, some percussion instruments, didgeridoos and amps. If you’re lucky, you may find a ukulele. The hostel itself is composed of two floors of a small apartment building, so there are kitchens for every group of rooms. We felt like we kept finding kitchens! Hostel Euphoria is located conveniently next to Tallinn’s medieval and beautiful Old Town, and a short walk from Tallinn’s newer downtown area, which has cafes, shopping and restaurants. Within minutes you can tell that Hostel Euphoria’s staff are all passionate about the city and about helping all guests have an awesome time in the city. The finale of our trip was going to see Tallinn’s Afro Beat Orchestra (ATBO) live at a bar in the revived and trendy Telliskivi area. Everyone from Euphoria went to cheer on the band! A few of the band members are musicians who work at the hostel. They rocked out, and so did everyone who danced to the beats. Thanks for having us, Euphoria! We can’t wait to be back in Tallinn. We have 229,813 written words.